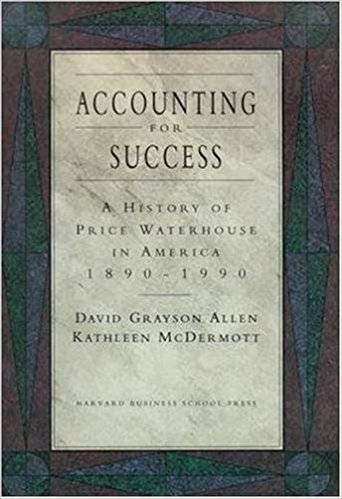 Set firmly within the larger context of American business history, Accounting for Success traces the evolution of the century-old accounting firm of Price Waterhouse (PW). Allen and McDermott divide Price Waterhouse's history into three distinct periods. The first part (1890 to the mid-1920s) covers the establishment of the American outpost of a British parent and the Americanization of its practice. The second (the next 40 years) highlights PW's rise to professional leadership and the important role played by the audit. The third (the 1970s and onward) focuses on PW's response to the challenges brought about by the globalization of the economy, heightened competition among firms and the growth of non-audit services. Since 1984, Harvard Business School Press has been dedicated to publishing the most contemporary management thinking, written by authors and practitioners who are leading the way. Whether readers are seeking big-picture strategic thinking or tactical problem solving, advice in managing global corporations or for developing personal careers, HBS Press helps fuel the fire of innovative thought. HBS Press has earned a reputation as the springboard of thought for both established and emerging business leaders.